Play – Learning or Just Fun? Play – Serious learning or just having fun? Is play really able to build a young brain? Or is it only about having fun? Actually it is both! 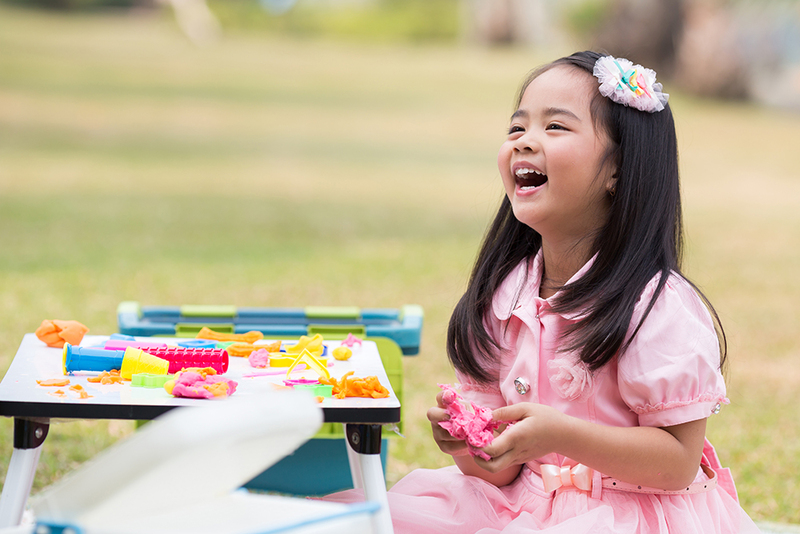 One of the reasons why play is a powerful brain building activity is precisely because of the fun element inherent during play. When a brain is having fun and enjoying an activity or interaction, important chemicals are released in the brain that enhances memory and learning. Young brains learn best through playful, fun and purposeful activities, making guided-play an excellent way to build a developing brain. In a guided-play session, there are usually serious learning objectives which a teacher or parent is hoping to achieve. However, the manner in which the activity is carried out is typically in a playful and fun format, with the child leading the play experience while being guided by the adult. A young child is constantly trying to make sense of the world, attempting to find meaning in every experience they encounter. As an example, while a baby probably does not find learning about the names of colours meaningful, they can thoroughly enjoy making colourful prints with paint (not all children find finger or hand painting fun though!). Having fun is meaningful to a young child, making them want to repeat the experience and thus creating practice opportunities. As the child repeats the play involving the colourful paints, he hears about the names of the colours repeatedly. Such experiences build important connections in the brains and over time, abilities, meaning and concepts are built. Some parents bring adult learning styles to young children, thinking that learning only happens when there is proper “teaching” (e.g. showing, naming and spelling colours “r-e-d”) and “training” (e.g. repeatedly flashing cards to teach Math concepts). Again, these techniques have not been shown to be appropriate for little brains. Learning is most effective when babies are actively watching and DOING, or when concepts are tied to practical contexts (e.g. pressing the correct number to go up a lift makes numbers much more meaningful than repeatedly viewing them on flash cards). During play, a child plays a very active role – moving, touching, manipulating, exploring etc. These are precious moments when important learning connections are being built in the brain – the brain is actively processing sensory information coming in from the eyes, ears, body and touch sensors, while at the same time coordinating with their muscles to perform an action. This flurry of activity between sensory and movement systems in the brain wires up brain connectivity – the key to abilities, performance and intelligence! Keep learning experiences fun and enjoyable for our little ones. Remember, “fun” is a lot more meaningful than “serious” at this stage. Babies’ brains crave meaning so learning through play makes a lot more sense and is much more effective in developing babies’ brains. Ensure baby is the one doing more than you during the play session. If you are the one completing the puzzle or building the blocks for baby, or giving extensive verbal instructions, than you may take away many important practice opportunities for baby. Sometimes, baby may need to practise components o f a task before being able to complete an activity independently. For example, holding a block with each hand and knocking them together helps baby practise right and left hand coordination. They will need to hone this skill before being able to stack a tower of blocks independently. Allow baby to take baby steps in reaching your final goal. Focusing on the process while keeping the final goal in mind is the key! Remember baby may not always get things right at the first instance, or they may choose to play in another way. These are perfectly fine! Remember to let baby lead for a while and gently guide them back to the activity. Always keep things light-hearted, fun and enjoyable! Finally, having fun does not always mean boisterous and noisy play. Make time for enjoyable quiet times too, like reading a book in an interactive manner with baby. Having fun could mean sitting in Mummy’s or Daddy’s lap and reading an interesting book!